We were encouraged to do this Kohler Cimarron review after a sales guy at a local store trashed the toilet in favor of the more expensive Toto. It’s true that Toto toilets command a loyal fan base on the internet. And for good reason too. The toilets are reliable, dependable and they are undoubtedly the leaders in R & D.
But to say that Kohler is junk is too farfetched. They are, after all, one of the oldest manufacturers of toilets and sanitary ware in the United States. And there’s a lot of positive press about the Kohler Cimarron with the upgraded class 6 flushing system. The Kohler Cimarron looks very identical to the Toto Drake. It features a 12-inch standard rough-in and installation is a cakewalk. This is an ADA compliant, comfort-height toilet with an elongated bowl. The height of the bowl is 17” from the floor. That’s 18” with a seat. Research suggests that comfort height toilets are more forgiving on your knees, especially if you are elderly or injured or recuperating after an injury. On a more generic note, it’s the perfect height for tall users. No more bent knees. No pins and needles either. The only caveat is that shorter users might find it a couple of inches too high for comfort. That’s by far, not a deal breaker. The Cimarron is made of premium-grade vitreous china and features a wider 2-1/8 in. glazed trapway. It ships without a toilet seat, which is a dampener. Also, the hardware to attach the toilet to the flange has to be purchased separately along with the wax ring. But it would be unrealistic to expect a soft-close lid at this price point. The flush tank is installed at a comfortable height and it is a light-touch flush that releases the water instantly. You do not have to keep the lever pressed for the flush to empty itself. The Cimarron was installed in a busy household with two boisterous kids who have an innate ability to clog toilets. So, as part of the initial tests, a lot of toilet paper and soybean paste was stuffed into the bowl. Sort of like a DIY map test. Enough to clog any old, builder-installed toilet for sure. As the flush lever was pressed, there was a uniform, forceful jet of water from all around the bowl. The rolls and the paste just disappeared into the bowl leaving no trace of skid marks. The older Kohler Cimarron Class IV toilets were notorious for leaving traces, as the flush used to miss some areas of the bowl completely. The upgraded flush is a beast. The AquaPiston canister is way better as compared to the old Flapper-styled one. It results in 360-degree water flow into the bowl. This clubbed with the single-flush gravity creates a powerful siphon styled stream that’s similar to the cyclone flushes in the Toto. It flushes efficiently and quietly, which is a much-appreciated feature because he lives with his elderly parent who’s battling Alzheimer’s and hates the din caused by fixtures. The Highline is one of Kohler’s bestselling toilets. It’s only natural that a lot of homeowners are confused about whether to pick it in place of the Cimarron. To be fair, both these toilets look very identical to each other. But there are subtle differences in the two which might allow you to make an informed decision while selecting one of them. There’s no difference in the installation. Both models come with a standard 12-inch rough in and you should be able to install them easily. The Highline has a more streamlined profile as compared to the Cimarron which is an elongated toilet. In a compact space, the Highline might be a better choice. But the Cimarron might be the more comfortable one. Also, there are more colors to choose from in the Highline. The Cimarron is only available in four colors. 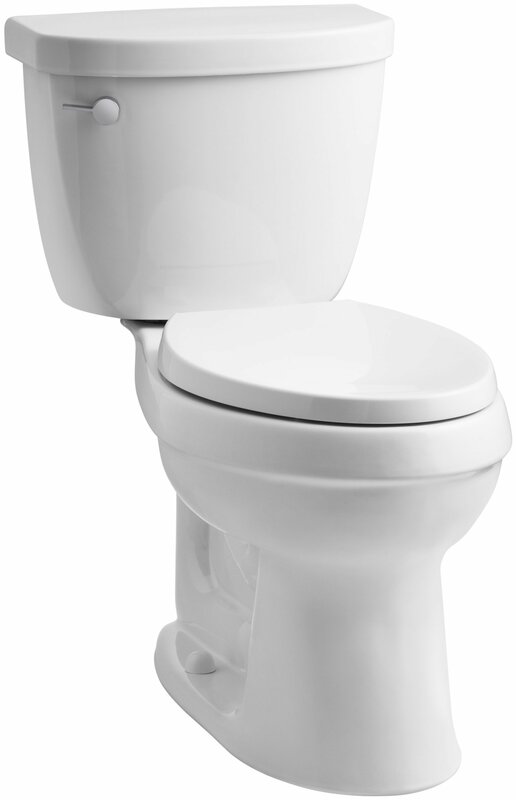 The Cimarron is a water sense certified low consumption toilet that only uses 1.28 Gallons per flush. The Highline, on the other hand, uses 1.6 gallons per flush. In terms of quality, there’s little to choose between the two. The Cimarron uses a Canister based flushing system whereas the Highline uses Kohler’s class five flush, which is a pressure-assisted model. Both toilets remain sparkling clean and leave no skid marks. You’d rarely have to flush twice. 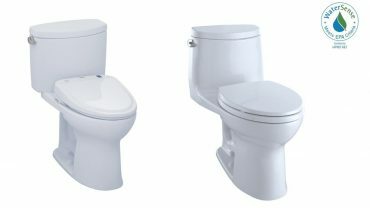 The Kohler Highline costs a lot more than the Cimarron, which makes the latter a more desirable choice for anyone looking for a budget-friendly toilet. 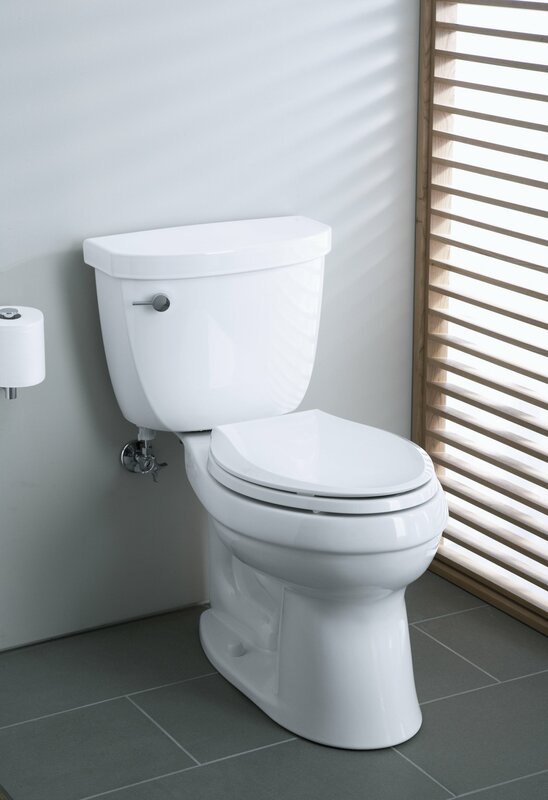 The Kohler Cimarron is a very good toilet that consumes less water, is quiet and is low on maintenance thanks to an efficient flushing system. It easily stands its own against a much higher priced model, the Highline. Unless you are hung up over the color of the toilet bowl, the Cimarron is the clear winner here.